Highly Pathogenic Avian influenza (HPAI H7 strain) has been identified on a poultry farm in Tennessee. Over 74,000 birds have been euthanized and a 10 km surveillance zone has been established around the farm. We North Americans will be very lucky if we don't experience a serious outbreak here this year. I encourage all of you and your neighbors not to rely on luck, and not to think that someone else is going to prevent HPAI from coming to your area. Low path avian influenza has been detected on a turkey farm in Wisconsin. This flock will be monitored and tested weekly until slaughter. Both of these detections are attributed to wild birds. If AI should hit your farm, you need to get back in business ASAP and you can help NYS Ag & Markets and USDA respond more quickly if you give these issues thought before the disease hits. You are the expert about how your farm operates what resources are available locally. All bird owners, whether commercial producers or backyard enthusiasts, should continue to practice good biosecurity, prevent contact between their birds and wild birds, and report sick birds or unusual bird deaths to State/Federal officials, either through their state veterinarian (in New York: 518-457-3502) or through USDA's toll-free number at 1-866-536-7593. 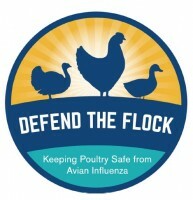 Additional information on biosecurity for can be found at www.aphis.usda.gov/animalhealth/defendtheflock. Please review your biosecurity plans, large and small operations alike. Give Nancy Glazier a call or email - 585.315.7746, nig3@cornell.edu - if you have questions or need resources on this.